“Sephawhuh?” I am sure that thought is running through many folks’ minds when they read the title of this post, but be at peace, and let me explain a bit. “Sephardic”, is a term which refers to Jews from Italy and the Iberian Peninsula–meaning Spain and Portugal. It is one of the designations of Jews which refers to the geographical homeland or origin, as well as to the liturgical style which they follow in worship. Other terms which describe groups of Jews which you may or may not have heard are “Ashkenazic,” which refers to Jews whose ancestry hails from Germany, Eastern Europe and the Baltic region, and “Mizrahi,” which refers to the Jews of the Middle East–technically, it means, “Eastern.” In the US, the terms used are usually Ashkenazic, meaning those of Eastern European ancestry, and Sephardic, meaning those from everywhere else, not just Iberia and Italy, with the term Mizrahi not used at all, which makes it all somewhat confusing. In Israel, all three terms are used–so some American Jews who have ties to Israel (or who are scholars or genealogists) may have heard the term Mizrahi, but it is not used commonly here at all. It is all very complicated, yes, and I am simplifying greatly, but I wanted to give some background here so that folks who were not Jewish could follow along a bit. Most Jews in the US are Ashkenazic, though there are a few Sephardic Jewish folks scattered about here and there. And so, the food that most of us Americans think of as Jewish are foods that are typical of Eastern European cuisines–cabbage rolls, brisket, knishes, kugel, latkes, blintzes, and of course, matzo ball soup. The foods of the Sephardi and Mizrahi are different, filled with the flavors of the Mediterranean, North Africa, Yemen, and the Middle East; with a much more pronounced use of spices and a myriad of herbs. Examples of Sephardic or Mizrahic foods would be hummus or falafel. On Monday, Zak had an uncomfortable stomach, and asked me for matzo ball soup, and while I was in the kitchen, I began to think about what it would taste like from a Sephardic or Mizrahi kitchen. This is because he is working on writing a story that features a character whose mother is an American Ashkenazic Jew and her father is Sephardic, and he had been asking me about what kinds of foods Sephardic Jews cooked and ate. I had been doing a bunch of research for him on the issue, and all of the cookbooks and recipes I had been reading had fired my imagination. So, I decided to experiment with the idea, and added a few spices, some tomato, some pasta, and a some chickpeas–and surprisingly, came up with a very delicious version of matzo ball soup, even if it probably doesn’t exist anywhere in nature. 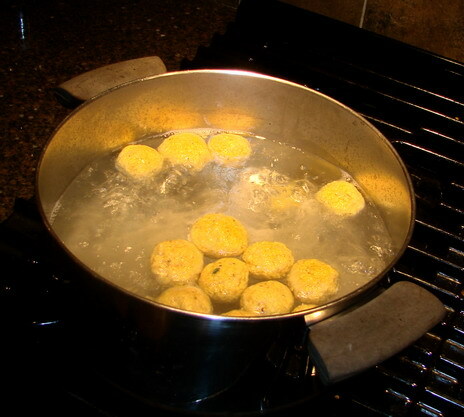 Matzo balls, as I mentioned before, are an Ashkenazic food; though I have read here and there that there are some Jewish families in Turkey who make them for special holidays. after I made this soup, I found a vegetarian Sephardic version, which interestingly contained all of the root vegetables I used in my own recipe. I used mine because we all like them, but, perhaps, they may be somewhat authentic after all. They are simply made; you beat together two eggs, two tablespoons of olive oil and two tablespoons of chicken or vegetable stock. Then, you mix in 1/2 cup of matzo meal, and season it as you like with salt and pepper. I also added some ground cumin, smoked Spanish paprika, and some thyme. Anyway, how did it all turn out? Zak, Morganna, Dan and James all loved it, and hoped I would make it more often. The Aleppo pepper, along with the browned onions, garlic and spices, gave a really strong flavor base to the soup. 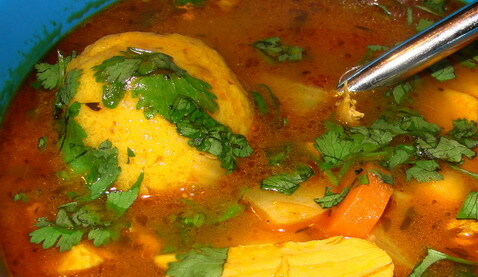 The turmeric and tomato combined to give a robust color and flavor to the broth as well, and the chickpeas not only added a good flavor, but their round shape echoed the matzo balls. The pasta could have easily been overdone, but thanks to the fact that I had very little of it on hand, it wasn’t. Now that I know that I could easily have overwhelmed the soup with too much pasta, I will have a care in adding noodles or pasta to soups in the future. The combination of cumin, coriander and cinnamon warmed the soup up considerably, giving it a lovely aroma that was warming not only to the body but the soul as well. There are variations I would like to do–like add some diced canned tomato, and probably more chickpeas. I would definitely use orzo in the soup instead of the ditalini I had here to use, although I am curious about how it would taste with rice added to it as well. 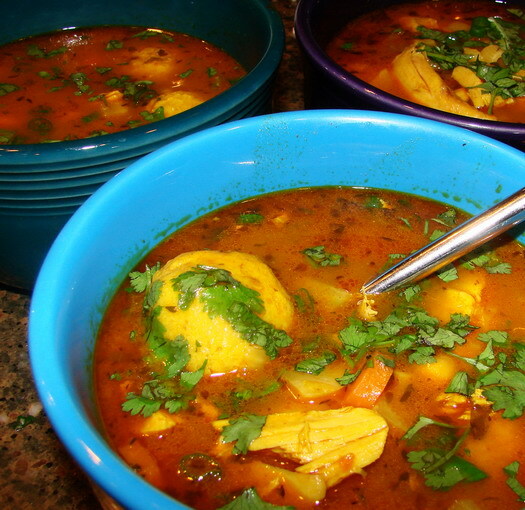 At any rate, it turned out to be quite a tasty soup, rich with chunks of chicken, root vegetables and chickpeas, fragrant with onions, garlic, herbs and spices, with delicately flavored matzo balls floating among the garnish of fresh green herbs among the droplets of golden chicken fat. You could conceivably make this soup in a crock pot, starting it in the morning or the night before, and having it ready for dinner. Then, all you would have to do is make the matzo balls. I made it in about an hour by using the pressure cooker. You could also cut down on the time involved by using only bone-in chicken breasts and thighs; these would cook faster, and would be easier to debone. Or, you could use already cooked and shredded chicken from another recipe, but your soup broth wouldn’t be as flavorful as the one made with a whole chicken. 1/2 cup orzo pasta, cooked, drained and oiled to keep from sticking. In a heavy soup pot or pressure cooker, heat olive oil over medium high heat. Add onions, salt and Aleppo pepper and cook, stirring, until golden. Add celery, bay leaves, garlic, thyme, cumin, turmeric, coriander and cinnamon stick, and cook, stirring until the onions are a rich reddish brown and everything is fragrant. Pour in sherry and deglaze pan. After alcohol has burned off, add chicken, broths, tomato paste or sauce, and turn down heat to a simmer, and cook covered until the chicken is tender and done. In a pot it will be about an hour or an hour and a half, in a pressure cooker, it can be anywhere from fifteen minutes to a half an hour depending on the size of the chicken. When the chicken is done, remove it from the pot and allow it to cool. While it is cooling, add carrots, parsnips and turnips to pot and simmer. Remove chicken meat from bones and add back to pot. Add chickpeas and tomatoes if you are using them. Cook until vegetables are tender. Remove bay leaves and cinnamon stick. Add matzo balls for last ten minutes of cooking. Just before serving, add orzo, simmer a couple of minutes to warm the pasta, then garnish with the cilantro, parsley and scallion tops. Serve with a crisp green salad with a simple vinaigrette. Note: As Emily, a longtime reader, pointed out, Ashkenazic Jews traditionally serve matzo ball soup at Passover. During that holiday, families who keep kosher, meaning, they follow the laws of Kashrut which involve what foods to eat, and how to eat them, do not eat either noodles or legumes. Sephardic Jews, on the other hand, do eat legumes at Passover. So, do understand that this soup I did not mean as a Passover dish, but rather a soothing, comforting soup for any day except Passover. And then, if it was for Passover, what was in it would depend upon the traditions of the household for which it was being cooked. You are right, of course, Emily. But then, I didn’t make this as a Passover dish. However, I think I will add a note to the post so that folks get that the pasta wouldn’t go into the dish at Passover for kosher households. Of course, lots of folks eat matzo ball soup lots of times other than Passover, but you are right–traditionally, it is a holiday food, so I should make note of that. It is fascinating how many cultural differences there are in the Jewish communities across the world. The foods are so different, the ways of cooking them–it just never ceases to amaze me. Of course, I feel like that about just about any cuisine–they are all filled with cultural and regional differences that I cannot help but be interested in. It is as if I can look into a people’s soul by looking at what is floating in their soup bowl. Barbara, Could you please tell us where you found the vegetarian recipe? 🙂 This Sephardic-loving Ashkenazi vegan would love to know. You will just have to figure out how to make the matzo balls without eggs. There is an egg substitute available at most health food stores that works pretty well for replacing eggs. It’s a chemical substitute in powdered form. It’s simply called “egg substitute” on the box with an Asian transcription of the name as well (Chinese or Korean). My sister uses this to make Matzo balls for her boyfriend (both are vegan, her boyfriend is Jewish). The cookbook Vegan with a Vengeance has a vegan matzo ball recipe. I don’t know if it contains egg substitute or not, but all of the recipes in that book are excellent, so I can recommend it despite not having actually made them yet. My father is African American and my mother is Ashkenazi Jewish. I like to make matzoh ball soup and put leftover collard greens and pot liquor in it. One year I was invited for Passover at a friends house whose family background was Sephardic (mine is Ashkenazi). I remember being amazed at the different things they ate. It was many years ago, so I don’t remember too many specifics, except there were eggplants and stuffed vegetables and I distinctly remember little beignet-type fried sweets. But I agree with the general consensus. Matzoh ball soup is good with anything, although I tend to make it rather pure and straight myself. Nicole–that is one of my favorite cookbooks. I just got it, and I love all of Claudia Roden’s books anyway, but this one is the best of them all. And I have found so many recipes I want to try in it. Amazing. Hi Barbara, I’ve been lurking at your lovely blog for some months now and finally tried out one of your gorgeous looking recipes! I make matzo ball soup a lot so I was really excited for a new twist on it – and I think I like this version even more than the plain chicken soup variety… mmm. It smelled amazing and now I have lots of leftovers. I will definitely be making this again in the future. Maftoul might also be a good choice for the pasta part — still not kosher, I don’t think, but regionally appropriate. Looks marvelous. I have always wanted to do a Sephardic-style seder, ever since I discovered that (1) the Spehardic matzoh is soft, and (2) the Sephardim eat rice during Pesach. I’ll be making your matzoh balls.